The necklace shown here is a representation of Dr. Mills’s “chop” or monogram, which is associated with his paintings and literature. It is a beautifully stylized flourish he drew of his initials. 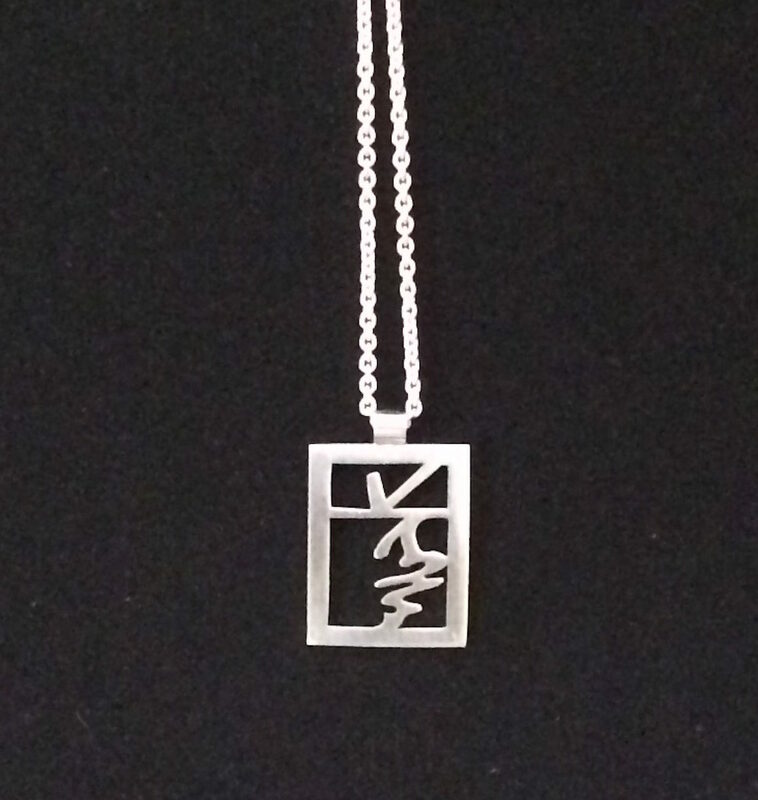 Richard Franz cut the original pendant from Sterling Silver and put it on a sterling chain. If you would like to own one there are some some choices to make. The pendant can be purchased with or without a chain. 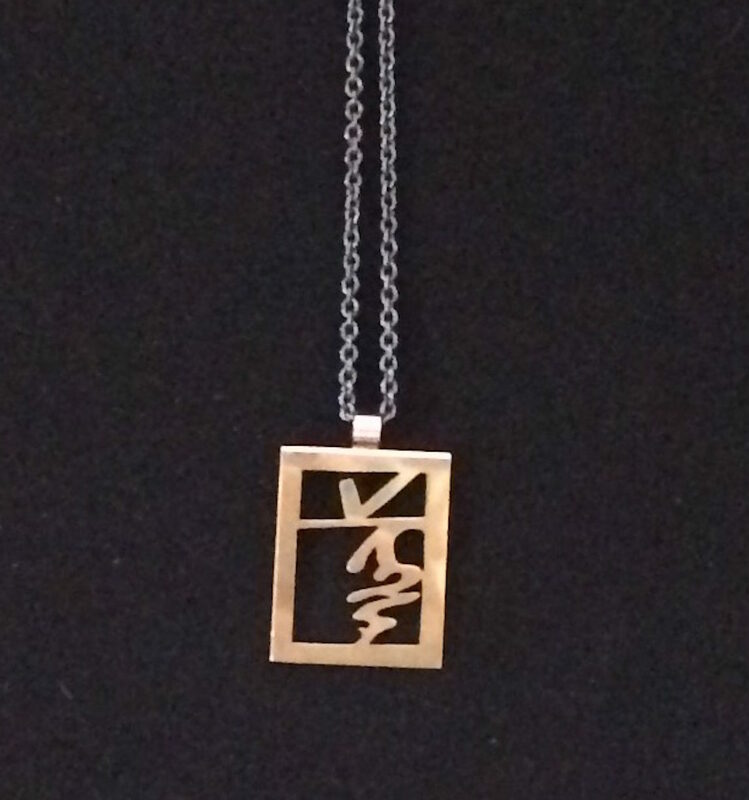 The pendant can be ordered in three different metals. Sterling Silver, Silver and Gold, or solid Gold in 14 or 18 Kt. A chain can be ordered in Sterling, antiqued blackened Sterling or solid Gold. The chain length must be specified. Please use the Order Notes box on the Checkout page for this purpose. In Silver the chains will remain the same price up to and including 25 inches. The “Silver and Gold Bimetal” choice means the pendant is cut from a sheet of Sterling bonded to a sheet of 18 Kt Gold. This is not plated, rolled or made with any other method where the silver is dipped in or electrically made to adhere to microscopic bits of gold. Rather, a sheet of each metal is pressed together using heat and pressure to create a true “bimetal.” This gives the beauty and luster of 18 Kt Gold and keeps it affordable. The bail on the bimetal pendant is solid 18Kt gold. If not specified the back, silver side of the bimetal will be antiqued blackened so the brightness of the silver does not detract from the rich color of the 18 Kt gold. Free shipping to the U.S. and Canada. Specify “Flat Rate” when checking out. If you are interested in solid gold please contact Richard Franz for up-to-date gold prices. At the time of this writing a guesstimate of the price of a solid gold pendant without a chain would be $950 CAD for 14Kt. and $1300 CAD for the pendant without chain in 18Kt. 15% of all proceeds goes to the KGM Foundation.